This one's marred by rubbish (horribly distorted) sound as well, damnit. 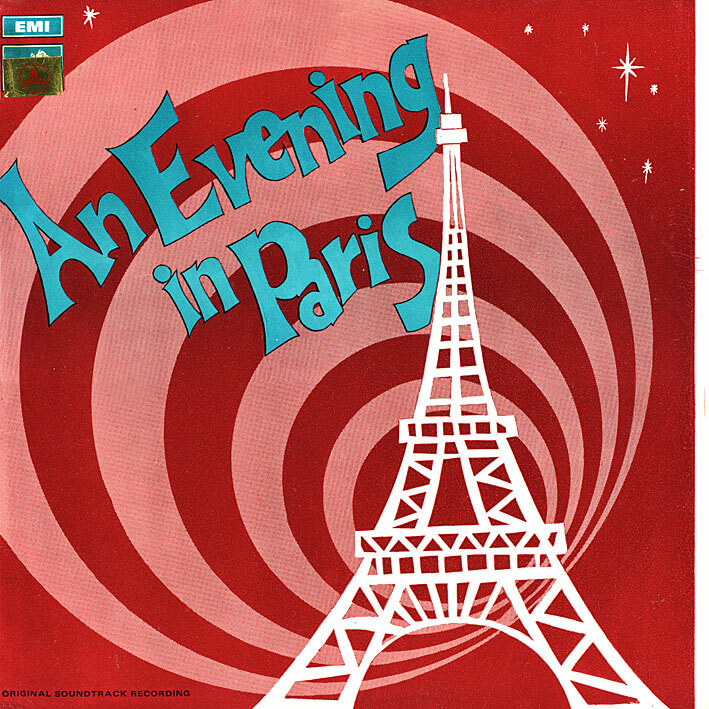 Although I'm a bit on the fence in regards to 'An Evening In Paris' [review] ; I keep thinking I should like it a lot as it's Shankar Jaikishan in their good period, there's plenty of rock'n'roll, Paris... the problem is I'm not able to find many strong melodies to latch on to. OK, the title track is quite good, and 'Leja Leja Leja Mera Dil' is pretty close to excellent, but that's basically it. The rest kind of feel like missed opportunities. I dunno, maybe I'm too demanding; two (or one and a half) out of nine really ain't that bad as soundtracks go. Maybe it'll still grow on me. Annoyingly, it's the best song here that suffers from the worst sound quality, ever. So as a bonus I've added a DVD rip of 'Leja Leja' to the download; it's still not very good but at least less distorted. And in case it's just my copy of this that sounds like crap (the vinyl looks pristine enough though, so I'm guessing it's the entire pressing) and anyone has a better version, please feel free to share in the comments. Thanks PC. Any Shankar-Jaikishan is always welcome! The DVD rip of Leja Leja Leja Mera Dil is definitely an upgrade. Thanks for including it! Thanks for the info Stephen, I'll definitely keep an eye out for it (not that I'm holding my breath, as I cannot recall ever having come across a copy). And yeah, was wondering about track lengths, as the DVD Leja Leja is substantially longer than on the record. Thanks for posting this, despite the sound problems -- this is one of my alltime favorite Bollywood movies, as incredibly cheezy as it is.. Regardless of any shortcomings, this is a classic - thanks for posting it, and thanks Stephen for the insight! Ah, I'd forgotten about the Shadows tune... you're right of course! I've just noticed that AEIP is available via iTunes - and that they've probably used the '75 pressing as master. Same rotten sound, and they've left Leja Leja out, I'm guessing because it's really too rubbish to sell. Is my rip any better ? I love Aasman Se Aaya Farishta from this. I'll send you my copy of Leja Leja...maybe my ears are not as finely tuned as yours but it sounds decent to them :) If you like it better I can send all of them if you want. There's a tiny (negligable) glitch in the intro, but other than that, the best one yet. The above is tagged as sung by Asha btw, which is wrong. Please try my version of "Leja Leja" its 4 mins 30 secs and sounds much much better. Can you post a new link to this soundtrack? Thanks! Not necessary, at least one of the existing links still work. Try again. I've just downloaded it via Megaupload; worked fine.